Fancy surviving on a desert island with a friend? That's now possible with a new experimental build of Stranded Deep [Steam]. To go along with this new feature, they also added a Player Ragdoll for when you're knocked out or dead. You partner can help you up with bandages before you bleed out and bodies can be dragged as well for maximum fun. It's good to see them add more from their roadmap, with plenty more still to come before it leaves Early Access. They also added a Raft Passenger Seat, fixed a bunch of bugs and updated Unity to "2017.4.13f1". Also the shark music won't play until you're actually attacked so no more early warnings for you. To access it, you will need to opt-in to the "experimental" Beta on Steam. 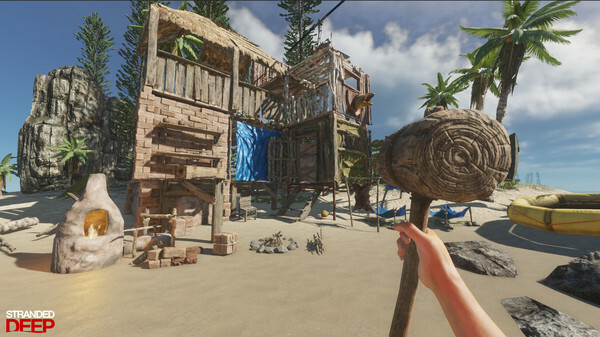 Hurray it's another survival-craft-'em-up on a tropical island! What sets this one apart? buenaventura Hurray it's another survival-craft-'em-up on a tropical island! Quote To access it, you will need to opt-in to the "experimental" Beta on Steam. After so many time, they still can not make game to work on stable build and not experimental? I want to download and play it. Especially, if I pay for it. Anyway, bad reviews still hold me from buying it.